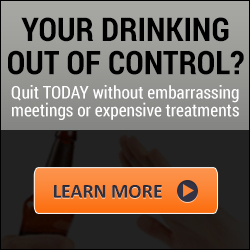 Alcohol is a major drug of use and abuse in the United States. 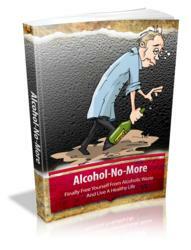 An estimated 15 million Americans (1988 NHIS study) are alcohol abusers or alcohol dependent. Lifetime prevalence of alcohol dependence is estimated at 13% and 4% for American men and women over 18 yr of age, respectively (1). It is well established that chronic excessive ethanol consumption produces marked deficits in cognitive and motor abilities (2,3). Alcohol is a leading cause of adult dementia in the United States, accounting for approx 10% of cases (Alzheimer's disease is the leading cause, accounting for 40-60% of cases). Although there is evidence of reversibility of deficits with sobriety (4), a variety of studies report that 50-75% of sober, detoxified, long term alcohol-dependent individuals suffer from some degree of cognitive impairment, and approx 10% of these are seriously demented (5). The damaging effects of alcohol appear to lie on a continuum, with moderate deficits in the majority of long-term alcoholics, progressing to the much more severe deficits of Wernicke's disease and Wernicke's encephalopathy with Korsakoff's amnestic syndrome (6,7). A variety of lifestyle factors, including nutrition, are implicated in the more severe cases. However, all deficiencies on the continuum appear to be related to alcohol consumption and to the amount of alcohol regularly consumed; that is, the most severe damage is associated with chronic long-term alcoholism (6,7). increases in the number and size of glial cells (9). Although it is not clear exactly how alcoholism leads to a reduction in brain weight and volume, it is clear that this does occur during active alcohol abuse and that some recovery of brain mass does occur during abstinence. More studies are needed to more clearly understand how chronic alcohol abuse leads to a reduction in brain mass and what occurs during recovery of brain mass in abstinence. The frontal lobes appear to be particularly affected in persons with chronic alcoholism, as first observed in early neuropathological studies (10) and confirmed more recently with neuropathological (11) and in vivo neuroradiological studies (12-14). Quantitative morphometry suggests that the frontal lobes of the human alcoholic brain show the greatest loss and account for much of the associated ventricular enlargement (15). Specific types of brain cells appear to be affected. Both gray matter, which is composed largely of neurons, and white matter, which involves neuronal tracks surrounded by myelin sheaths, appear to decrease. Studies have found that neuronal density in the superior frontal cortex is reduced by 22% in alcoholics compared to nonalcoholic controls, in contrast to other areas of the cortex, in which there was no difference between the groups (16). Further, the complexity of the basal dendritic arborization of layer III pyramidal cells in both superior frontal and motor cortices was significantly reduced in alcoholics compared to controls. A reduction in dendritic arborization of Purkinje cells in the anterior superior vermis of the cerebellum is also found in alcoholics. Taken together, these data demonstrate selective neuronal loss, dendritic simplification, and reduction of synaptic complexity in specific brain regions of alcoholics. It remains uncertain how these cellular lesions relate to the selective loss of white matter that appears to occur in frontal lobes. One reason that these frontal lobe changes are more evident is the greater proportion of white matter to cortical gray matter in the frontal regions. Frontal lobe shrinkage has been reported with and without seizures, but recent studies suggest that temporal lobe shrinkage occurs particularly in individuals with alcohol withdrawal seizure history (17). Decreases in the amounts of V-acetyl aspartate in the frontal lobe, a measure of neuronal volume or density, also illustrate frontal lobe degeneration in alcoholics (18). Alcoholics with more severe brain disorders, such as Wernicke's and/or Korsakoff's syndrome, show more reduction in white matter and more extensive brain-region degeneration, consistent with their greater alcohol consumption. In addition to the global shrinkage of brain regions, certain key neuronal nuclei that have broad-ranging functions on brain activity are selectively lost with chronic alcohol abuse. Important regions altered in alcoholism are the cholinergic basal forebrain nuclei, which are also lost in Alzheimer's disease. Animal studies and some human studies have suggested that this region is particularly damaged in alcoholic subjects. Arendt found a significant loss of neurons in this region in alcoholic Korsakoff's psychosis patients (19). Fig. 1. Binge-drinking-induced brain damage in perirhinal cortex as revealed by amino cupric silver staining. Shown are two different magnifications of a rat brain stained with amino cupric silver stain to identify damaged neurons following a 4-d binge ethanol treatment (28). Rats were treated intragastricly with ethanol in a high dose model of ethanol binge drinking. Brains were sectioned and stained to reveal neuronal damage using the amino cupric stain of de Olmos (29,30). Shown on the left is a 4x magnification illustrating the edge of the brain and the perirhinal fissure with significant silver staining in pyramidal cells in that region. 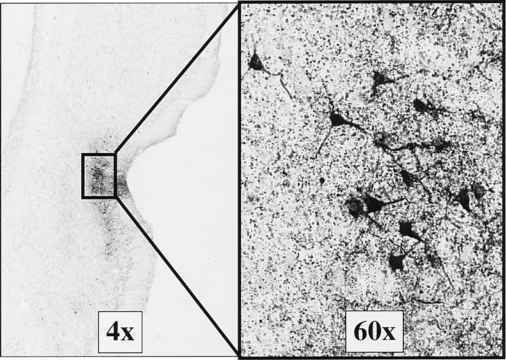 On the right at 60x magnification, one can clearly see neuronal-like structures revealing that short-term ethanol administration can significantly damage the brain (28). small but functionally significant brain areas could result in global changes in attention, mood, and personality that are difficult to quantify but have a great impact on brain function and overall behavior. Recent studies have found that long-term ethanol intoxication is not necessary to cause brain damage. Studies in rats show that as little as a few days of intoxication can lead to neuronal loss in several brain areas, including dentate gyrus, entorhinal, piriform, insular, orbital and, perirhinal cortices and in the olfactory bulb (27,28) (Fig. 1). These structures are involved in frontal cortical neuronal circuits, including the limbic and association cortex. These findings are consistent with recent human studies reporting damage to the entorhinal cortex (31) and significant hippocampal shrinkage (32) in alcoholics. Hippocampal damage during chronic ethanol treatment has been correlated with deficits in spatial learning and memory (9). Thus, cortical and hippocampal damage occur with chronic ethanol treatment, and relatively short durations of alcohol abuse may cause some form of damage. Additional studies are needed to understand the molecular mechanisms involved in selective neuronal death and the factors that regulate brain-regional sensitivity to ethanol neurotoxicity. Alcoholics who do not have Korsakoff's amnestic syndrome show decreased neuropsychological performance compared to per nonalcoholics on tests of learning, memory, abstracting, problemsolving, visuospatial and perceptual motor functioning, and information processing (33). Alcoholics are not only less accurate, but take considerably longer to complete tasks and are differentially vulnerable to these deficits. Many of the deficits appear to recover to age-appropriate levels of performance over a 4- to 5-yr period of abstinence (33). Although global cerebral mass returns toward normal levels with extended abstinence, not all cognitive functions return. Some abstinent alcoholics appear to have permanent cognitive impairments, particularly in memory and visual-spatial-motor skills (34). Other studies show a loss of logical memory and diminished paired association learning in alcoholics that may be long-lasting (35). This suggests long-term changes in brain function following chronic alcohol abuse that likely relate to permanent changes in neuronal plasticity and circuitry. Electrophysiological studies using brain electroencephalogram (EEG) and early receptor potential (ERP) have revealed that alcoholics have difficulty differentiating relevant and irrelevant, easy and difficult, and familiar and unfamiliar stimuli (36). These deficits may be related to frontal cortical function. One hypothesis regarding the development of alcoholism is that an initial state of disinhibition/hyperexcitability, perhaps because of low frontal cortical impulse inhibition, is a predisposition for alcohol abuse leading to dependence (37). Interestingly, these are the same areas damaged by chronic alcohol abuse, suggesting a cycle where frontal cortical hypofunction promotes further alcohol consumption, contributing to the progression to addiction (2). Both clinical and experimental studies show frontal cortical involvement in the neuropsychological dysfunction of alcoholics, particularly those with Korsakoff's syndrome (38). Functions affected include emotional abilities, disinhibition, perseverative responding, problem-solving abilities, and attention. It is of note that the prefrontal cortex, which sends and receives projections from the basal ganglion, may play an important role in addiction and drug-seeking behavior. Prefrontal damage is typically associated with changes in personality and elusive cognitive abnormalities. Recent studies have emphasized the role of the prefrontal cortex in executive cognitive functions (39). Executive cognitive functions are those higher mental abilities such as attention, planning, organization, sequencing, abstract reasoning, and the ability to utilize external and internal feedback to adaptively modulate future behavior (40). These abilities are diminished in alcoholism and other diseases showing prefrontal damage (41), and disruption of these functions has been implicated in the aggression associated with substance abuse (42). Although these types of change in brain function are difficult to assess, they are consistent with the morphological changes found in the frontal cortex, as well as damage to the association cortex in animals shown in recent studies. There is evidence that alcohol-induced neurotoxicity is related to changes in glutamate and GABA transmission. The major excitatory and inhibitory neurotransmitters in the brain are glutamate and GABA, respectively. It follows that the ionotrophic glutamate receptors N-methyl-d-aspartate (NMDA), (,RS)-a-amino-3-hydroxy-5-methyl-4-isoxazole propionic acid (AMPA), and kainate, and the GABAA receptors are among the most widely distributed and abundant receptor-operated ion channels in the central nervous system (CNS). Both NMDA and GABAa receptors are composed of multiple subunit proteins, which are thought to assemble as heteropentameric structures that exhibit distinct properties depending upon the particular subunit composition. Identified subunits include a1-a6, P1-P4, y1-y4, 8, and pl-2 for GABAA receptors, and NR1, NR2A-NR2D, and NR3A for NMDA receptors. Additional variants of both GABAA and NMDA receptors are generated by alternative splicing (43). There is convincing evidence that excitatory NMDA and inhibitory GABAA receptors are important sites of action of ethanol. Studies using a variety of tissue preparations (i.e., heterogeneous neuronal preparations and cells transfected with receptor subunits) demonstrate that pharmacologically relevant concentrations of ethanol can potentiate GABAA receptor currents and antagonize NMDA receptor currents (43,44). It is likely that the combination of reduced excitatory glutamate-mediated activity and enhanced inhibitory GABA-mediated activity contributes to ethanol intoxication. Brain-regional differences in the ethanol sensitivity of NMDA and GABAA receptors have been noted (43,45), leading to the hypothesis that the ethanol sensitivity of native NMDA and GABAa receptors is determined, at least in part, by the subunit composition of the receptor. This is supported by studies using recombinant expression systems showing that the ethanol sensitivity of these receptors varies with the particular subunits expressed (43,46), there is considerable evidence that specific hydrophobic sites of the receptor polypeptides are crucial for modulation of ionotrophic glutamate and GABAA receptor function by ethanol and volatile anesthetics (47,48). In addition, phosphorylation and dephosphorylation play an important role in regulating NMDA and GABAA receptors, and second-messenger phosphorylating systems that directly or indirectly modulate receptor function can be disrupted by ethanol.